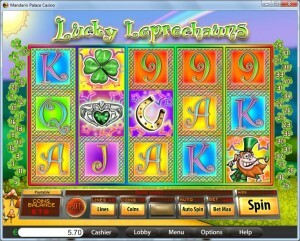 In Lucky Leprechauns you’re going to find a very Irish slot machine, using many of the legends and stories of this country and including them among the symbols and the surrounding graphics. It’s a game which was designed by Saucify, but this particular theme is used in dozens of games, from all slot creators. There are a couple of things that most of them have in common, and those are the leprechauns, the rainbows, pots of gold and the four leaf clovers. 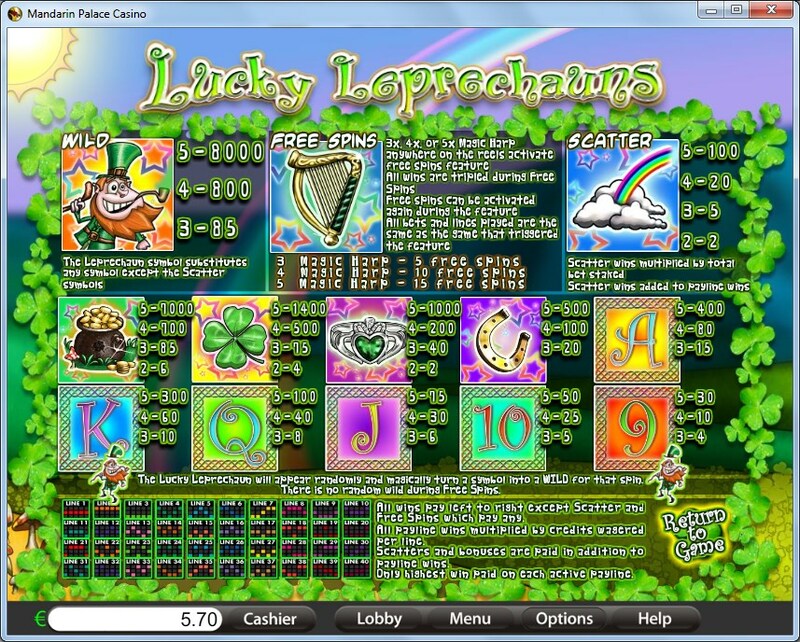 5 reels are loaded in Lucky Leprechauns, with up to 40 active lines formed on them. There are also free spins, scatter symbols, 3x multipliers and a wild. Prizes reach a maximum value of $20,000. 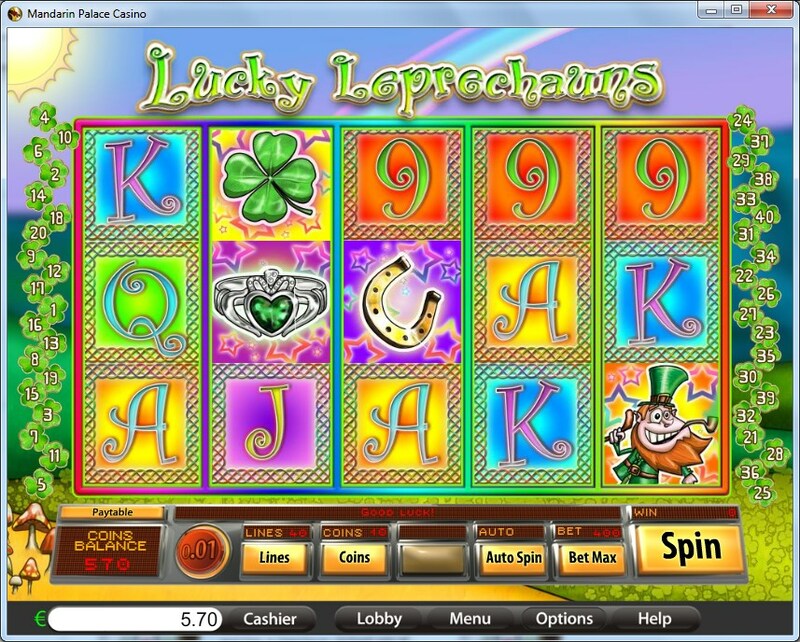 If you consider the features offered by Lucky Leprechauns, you will find that the game does a pretty good job in this area, mixing together the wild symbols, the scatters which pay prizes and the ones that give you the free spins with multipliers. The Leprechaun should be the first one we cover, not just because it’s the wild symbol, but because multiple symbols of this type can form a combo which awards the top jackpot of 8,000x the line wager. For that, you need up to five icons on the same active line. On its own, the wild Leprechaun can substitute for the other symbols with regular roles, as long as they’re not scatters. The Rainbow scatter is responsible for giving away prizes, and in order to win them you need to have a minimum of two such icons present on the reels, in whatever position they happen to land in. For its best payouts, you will need all five present, in which case you get 100x the total bet. Once the free spins have been triggered, you will get 5, 10 or 15 rounds. The number depends on how many triggering Magic Harp scatters are present, 3, 4 or 5 being needed. Whatever wins you get along the way, as you play through the free spins, they will be worth 3x the usual amount. You will also get a chance to retrigger the free spins, but it’s up to your luck to bring you the 3+ scatters needed again. The game will let you bet between $0.01 and $100 on each spin. The coins have maximum denominations of $0.25 and you can use up to 10 on each line you cover. With 400 coins of $0.25, you get to the maximum level of $100 per spin, while the line bet is at $2.50. You’re offered 8,000 times the line wager by the five wilds when they’re forming a combo, and that would be up to 80,000 coins, or $20,000 cash. It’s a very Irish theme, and you will see it from the first moment you lay eyes on it. There is green everywhere, from the background grass covered hills, to the four leaf clovers which surround the reels of the slot. There is a rainbow in the distance, and it’s an image which also makes an appearance in one of the symbols. Though a lot of themed symbols are there, you will also get some poker cards. Symbols: Leprechaun (8,000x, wild), Magic Harp (scatter), Rainbow (scatter, 100x bet), Pot of Gold (7,000x), Clover (1,400x), Emerald Ring (1,000x), Gold Horseshoe (500x), Ace (400x), King (300x), Queen (100x), Jack (75x), 10 (50x) and 9 (30x). The Irish theme is not a good enough reason to play the slot, since there are so many others with the same topic, but the game does well in other areas, specifically with its features and the top prize. You will find Lucky Leprechauns at any online casino which chooses to use software from Saucify/BetOnSoft , playable either for free or for real money.